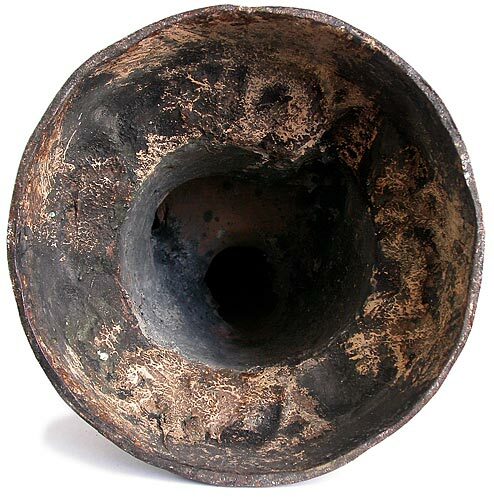 Condition: oxidation, gilt loss and minor imperfection! Maitreya, the Future Buddha, whose name in Sanskrit means “Loving Kindness”. Along with Gautama Buddha, he was the most celebrated figure of the Gandhara art in the first century. In the 4th-6th century China, there was little distinction in the iconography of these two Buddhas. Later scholars attributed the origin of the pensive Maitreya as the young Prince Siddhartha in meditation pose. The oldest of such pensive Buddha excavated in Hebei Province in China bears the date of 553 A.D. (Tianbao). 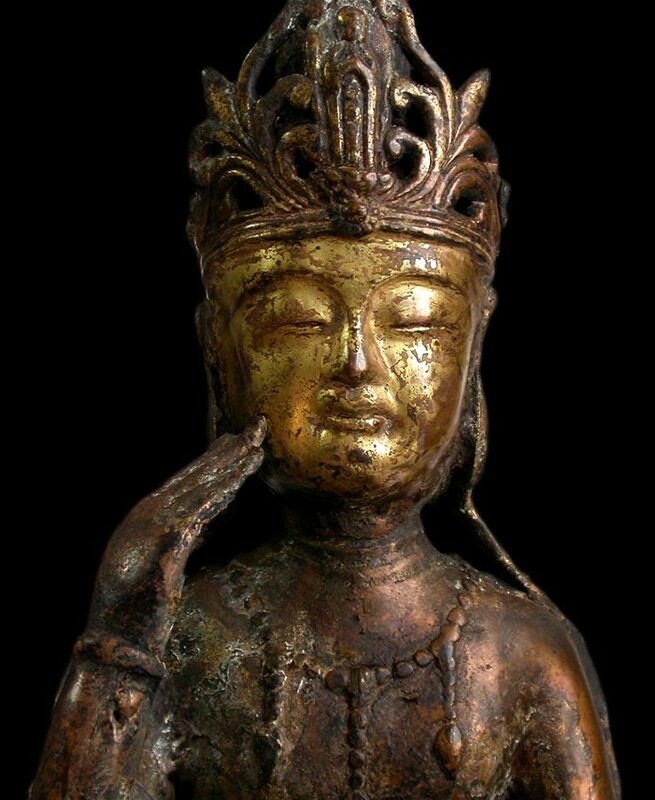 A similar wood Maitreya in Koryuji, Kyoto is dated 660 A.D., and a bronze pensive Maitreya in Korea dated late seventh century. The Pensive Meditating Bodhisattva is popularly known in Japan as Hanka Shii Bosatsu, or Hokan Miroku, the Crowned Maitreya. 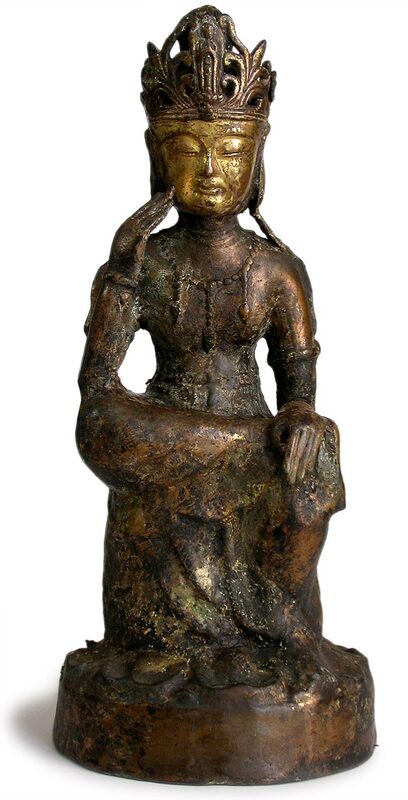 As shown here in this exemplary rare bronze, he is seated on an invert facing lotus toza, leaning slightly forward with right hand fingers gently touching his cheek, while his left hand is placed above the right ankle that rests on the pendent left foot, in a classic hanka shii pose that denotes Maitreya presiding over the Tushita heaven. 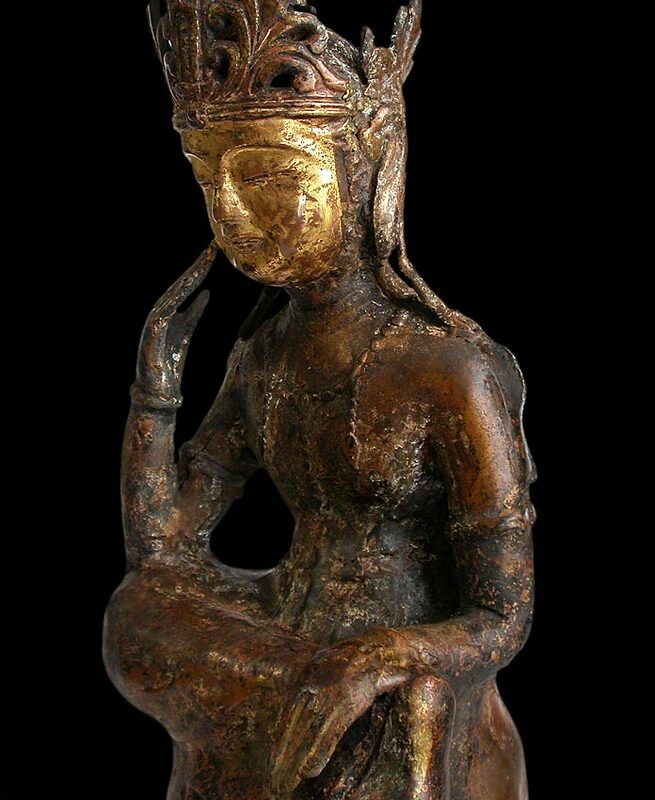 Stylistically the stout physique of this Crowned Maitreya resembles the small gilt bronze found in the 8th century Nara period, which was the Empress Koken’s personal devotional icon. On both of these pensive Maitreya statues, their lavishly adorned armlets, bracelets and necklaces are nearly identical, the high topknot and large crown embellished with tassels are also comparable, although the empresses statue has a three-sided crown, here this Maitreya is elaborated with a sumptuous crown of five-leaves arrayed in a patulous floral design, and situated in the center is a small Buddha standing in prayer. Evidently this refinement indicates a later dating, tentatively towards the brief renaissance in the Kamakura period (1192-1333), when the reconstruction of the Kofukuji temple initiated a flood of creation for Buddhist art. In contrast, the drapery folds of this statue is noticeably plain, not unlike the few other earlier pensive maitreya statues found in the 7th century Japan and Korea. 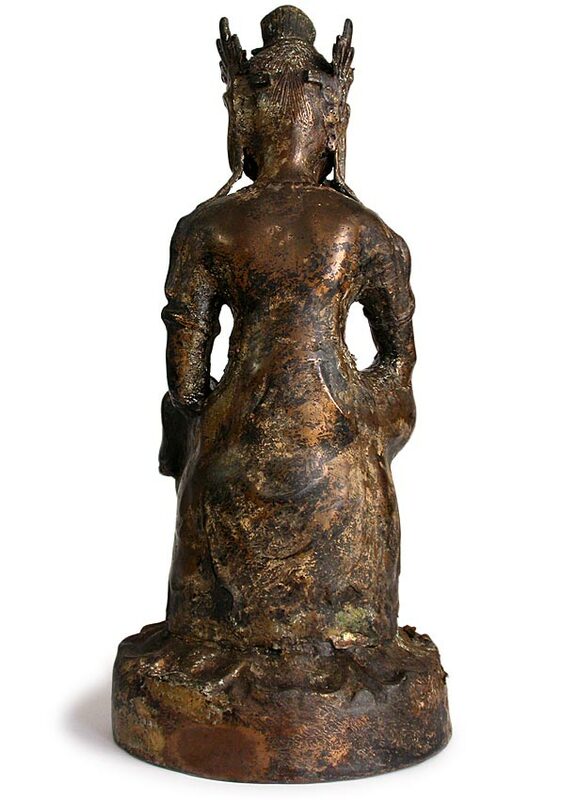 Apparently this aged bronze figure and pedestal were cast in one piece. With original finish flaked off in irregular patterns, leaving a mottled shading of old lacquer with patches of gold highlights, while some surfaces appear burnished from touching, the superb gilding on the face of Maitreya remains well preserved, seemingly this bronze was initially made for an eminent benefactor.